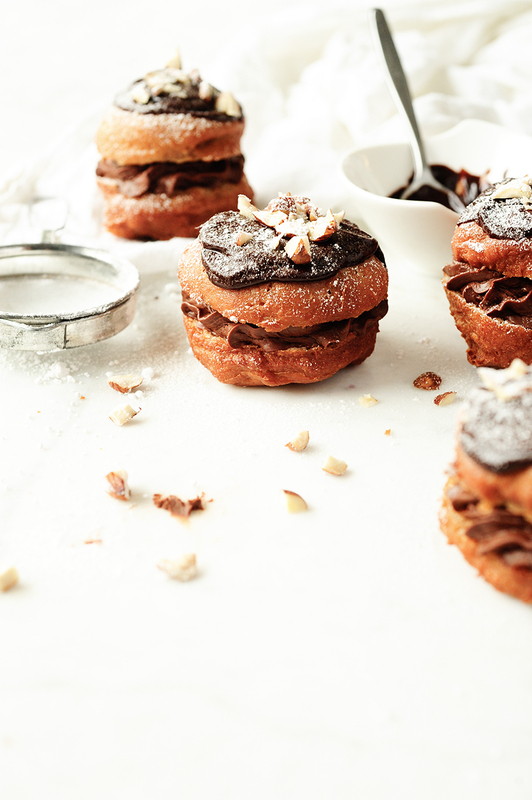 Light, delicious donuts layered with chocolate mousse. 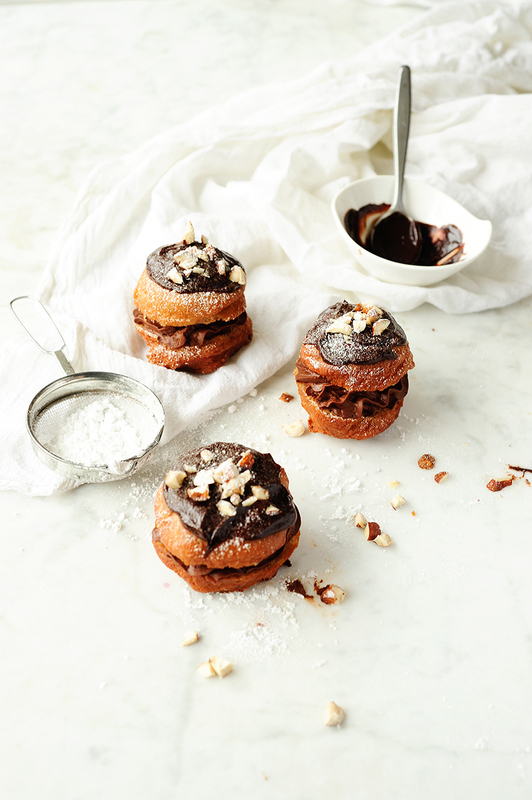 The ganache topping with chopped nuts makes these donuts a real treat. They are easy to make and so good that I suggest making them when you have a group of friends around to help you consume them. They’re addictive! Pour the warm milk in a bowl, add yeast, 1 tablespoon sugar and 1 tablespoon flour. Let stand for 10 minutes. Sift the flour in a large bowl, stir in the remaining sugar, salt, cocoa powder and ground hazelnuts. Add the egg and egg yolk and pour the risen yeast. Knead the ingredients and add at the end the melted butter. Knead for a few minutes until the dough is smooth and elastic. Place in a greased bowl, cover and let stand in a warm place to rise until doubled for about 1,5 hours. Then place the dough on a floured work surface and knead for several minutes. Roll to about 2 cm thickness and cut out 6 cm circles. Put down on a lightly floured surface, cover and let stand in a warm place to rise for 45 minutes. Deep fry in fat at 175 degrees, 2 minutes on both sides until golden brown. Pick out with a slotted spoon and set aside on paper towels to cool. Dissolve the chocolate in the microwave, beat the cold coconut cream stiff with icing sugar. Adding the melted chocolate at the end. Put the mousse into a piping bag and cool for 30 minutes. Make the ganache, dissolve the chocolate with coconut cream. Add the butter and stir. Cut the donuts in half and decorate with chocolate mousse. 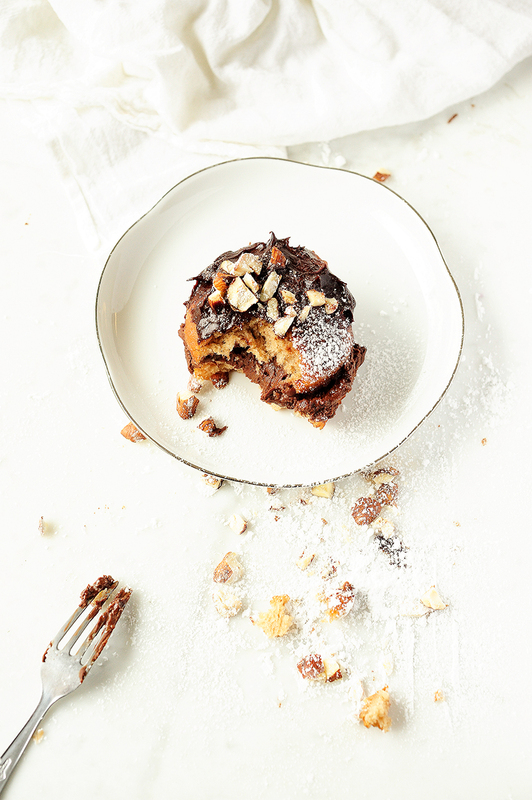 Garnish with ganache, sprinkle with chopped nuts and icing sugar.